Today I’d like to turn to an old theme–the tendency for Disney movies to disparage intellectual villains in favor of physical heroes and apologize for economic and social injustice. Previously, I wrote about how The Lion King, rightly interpreted, is really about Scar’s attempt to liberate the hyenas from a racist lion oligarchy. Today I’d like to do something similar with Aladdin, reconstructing the plot so as to render Jafar the hero. In the original version of Aladdin, the sultan of Agrabah, a fictitious Islamic sultanate, demands that his daughter Jasmine wed a prince within three days. Frustrated and dissatisfied with her marriage options, Jasmine frequently flees the palace. On one such flight, she encounters Aladdin, a poor thief who is on the run. Aladdin is arrested for thievery, but not before he charms Jasmine, saving her from a merchant who intended to remove her hand for taking an apple. Jasmine asks the Grand Vizier, Jafar, to release Aladdin, but Jafar claims to have already had Aladdin executed. In truth, Jafar persuades Aladdin to go into a cave to retrieve a lamp for Jafar. Aladdin retrieves the lamp for Jafar and discovers a magic carpet. Upon receiving the lamp Jafar attempts to kill Aladdin to tie up loose ends, but in the course of this failed effort, he loses the lamp. Aladdin falls into the cave with the lamp.The lamp contains a genie. The genie helps Aladdin to become a prince so as to make him eligible to marry Jasmine. Aladdin’s prince persons is unappealing to Jasmine, until he takes her on a magic carpet ride. Jafar, who has hypnotized the sultan to believe that Jasmine should marry him, allowing him to become sultan, feels threatened by Aladdin and attempts to have him drowned. Aladdin is rescued by the genie and exposes Jafar’s plan. Jafar’s parrot steals the lamp, delivering it and the power of the genie to Jafar, who uses the genie to become the sultan and a powerful sorcerer. He exposes and exiles Aladdin and imprisons the sultan and Jasmine. Aladdin returns from exile, battles Jafar, and goads him that the genie is more powerful than he himself is. This persuades Jafar to wish himself to be a genie. Jafar fails to realize that genies are bound to lamps and are not free, and consequently loses his power. The sultan changes the law, allowing Jasmine to marry commoners, and they all live happily ever after. This version of the story ignores the wider social implications and complexities that are hidden just beneath the surface. Jafar wants power for seemingly no reason–he is already Grand Vizier, he already controls the guards and lives comfortably. In contrast, the sultan’s regime is whitewashed. The only thing wrong with the sultan, insofar as the film is concerned, is his unwillingness to permit his daughter to marry a commoner who can bring no new wealth or allies to the realm. Like The Lion King, Aladdin is a very black and white narrative–it’s very simple. Let’s spice things up. There has rarely in the history of human civilization been a society as thoroughly unequal and unjust as the one portrayed in Aladdin. The palace is reminiscent of Nero’s golden house. Jafar recognizes his society’s moral failings. Think about it–why would Jafar wish to be the sultan otherwise? He is already Grand Vizier, he already enjoys a very high standard of living and significant prestige. Why would he risk all of this unless he believed he could do something truly different with the power he would gain? He wishes to eliminate the sultan and give the wealth the sultan accumulated through corruption back to the people. However, Jafar is not himself of noble birth and does not have a sufficiently strong support base to challenge the sultan outright. While Scar could rely on the disaffected hyenas to help him displace Mufasa, the common people of Agrabah are no match for the sultan’s huge police forces. Indeed, the sultan’s political influence runs so deep in Agrabah that many of the common folk are not even conscious of the extent to which they are being oppressed. Aladdin looks upon the palace with marvel and wonder, never so much as questioning whether some of the immense wealth it contains should be used to feed him. In this way, the oppression in Agrabah is so hegemonic as to be imperceptible to its victims, who have become the willing slaves of a tyrannical oligarch. This has forced Jafar to pursue a very different strategy from the one pursued by Scar. While Scar, who was himself of royal blood, could stir up discontent within an oppressed population that recognized its oppression, Jafar, who is a commoner (albeit a very talented one), must ingratiate himself with the ruling family so as to undermine them from the inside. Jafar’s efforts at ingratiation however appear to be failing. When he tells Jasmine that he has executed Aladdin for thievery–carrying out the laws in full accordance with orders from her father–she tells him that when she succeeds her father upon her marriage to a prince, she will do away with Jafar. Jasmine is intended to be married within three days, so this forces Jafar to expedite his plan. Initially, Jafar pursues the lamp, knowing that a genie can give him the power to take the realm from the sultan. However, when he loses the lamp to Aladdin, he is forced to pursue an alternative strategy, hypnotizing the sultan into marrying him to Jasmine. By becoming one with the royal family, Jafar will finally be in a position to bring it to heel. Meanwhile, what does Aladdin do? Aladdin, upon acquiring the lamp, does not even think for a moment to relieve his fellow compatriots of their poverty. Instead, Aladdin immediately betrays his class. He proverbially forgets where he came from. Right from the start, Aladdin elects to elevate himself and himself exclusively into the ruling class. This he does not just in pursuit of riches for himself, but out of lust for the princess. We are meant to excuse this, because Aladdin promises to release the genie from slavery with his third wish, but this Aladdin does not even do until it is clear that the princess is romantically interested in him regardless of whether or not he is to remain a prince. It’s quite fair to say that nothing matters more to Aladdin than the fulfillment of his short term sexual desires. Jafar recognizes that Aladdin is a royalist, a devoted reactionary who will maintain the status quo, who seeks to gain the princess and the sultanate exclusively for his private gain. Jafar is disgusted by Aladdin’s egoism and seeks to eliminate him and regain the lamp for himself, the latter of which he eventually does. 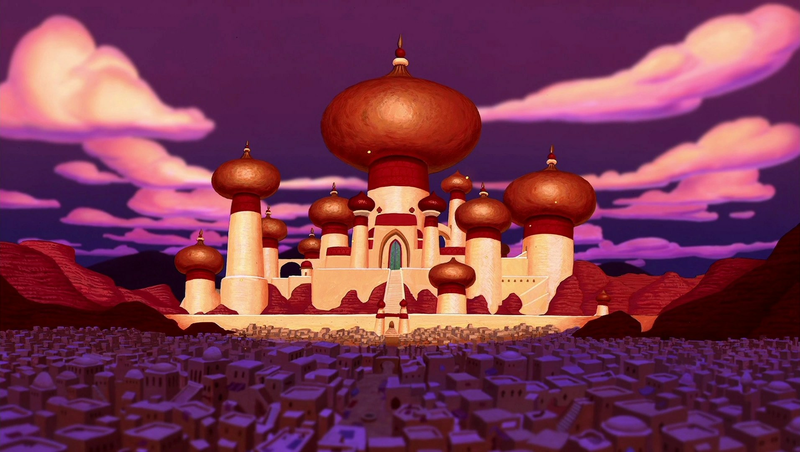 The rest of the movie takes place within the palace, as Aladdin attempts to undo Jafar’s coup. What is not shown is what happens outside the palace in Agrabah itself, where Jafar has opened the palace coffers and embarked upon ambitious efforts to supply Agrabah’s underclass with jobs, commissioning new infrastructure projects, buildings schools and hospitals, and reforming the draconian laws of the sultan. That Jafar is eventually tricked into making himself a genie and defeated is just another case in a litany of brainy Disney villains being tricked by trivialities they should have by all rights seen coming miles away. Aladdin is thoroughly uneducated and in no position to defeat Jafar, a learned vizier, in a battle of wits. Aladdin is a con man, but he is no sorcerer. In a more realistic telling, Jafar’s mystical powers are exaggerated to build Aladdin’s hagiography. He never becomes a genie but is instead murdered by Aladdin and his royalist cohorts in a counter revolution that renders Jafar’s life’s work meaningless. Instead of challenging the social order in Agrabah, Aladdin reduces its injustice to a matter of a single law, the law preventing the princess from marrying commoners. This law is completely meaningless to the throngs of impoverished peasants that line Agrabah’s streets. Its reform means nothing to them. While The Lion King at least featured the hyenas as characters, the peasant underclass in Aladdin ultimately goes voiceless. In a better movie, the hero would challenge and eventually completely reverse unjust policies, leaving his society markedly better off than where it started. In a better movie, the hero would fly the love interest around not as part of a deception, but to show her who he truly is. Movie studios are more than capable of making morally sophisticated films of that kind that are appropriate for children (e.g. How to Train Your Dragon). Such movies encourage people to have a social awareness that the old Disney movies seemingly go out of their way to silence. That’s….pretty awesome. While Aladdin is up there on my Disney favorites list (everyone has one, no use pretending otherwise), I think the opposing viewpoint here is pretty well thought out. What about the other movies, though? The common themes that permeate Disney movies like the constant killing of parents and uselessness of fathers? I never appreciated the contempt for intellect that Disney also shows, so thanks for that. Good topics.